Whilst weather conditions were somewhat calmer than those experienced in the previous week nevertheless Day Two saw some exciting racing between another four teams out of the seven who registered for the Royal Malta Yacht Club 2015 Match Racing Winter Series. 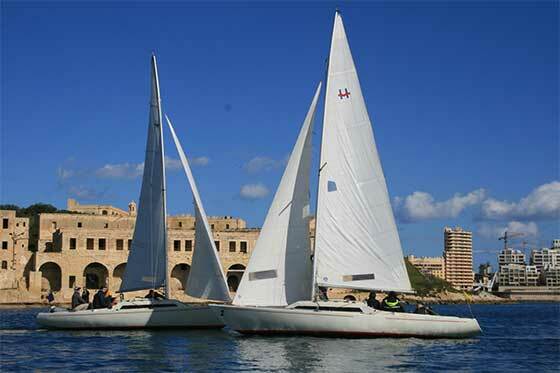 Conditions started off with no wind and some rain but soon turned into perfect match racing conditions with bright sunshine and a light north westerly breeze; the sort of conditions that makes Malta the ideal venue for winter sailing. David Anastasi's team made up of Mark Vassallo, Tom Bonello Ghio and Karl Miggiani emerged as the overall winners of the day. It was a hard fought battle between Anastasi and Matthew Fleri Soler's teams, with each team winning a race each. Anastasi was beaten in the start of the first race but came back and managed to overtake Fleri Soler around the second mark. Anastasi won the start of the second race but missed a crucial wind shift just after the start which favoured Fleri Soler and allowed him to win the race by a convincing lead. The competition between these two teams will be something to look out for over the rest of the Series. Patrick Vassallo and Marco Sartori, the two new-comers to the Series struggled against the more experienced teams. Sartori managed a win against Fleri Soler, upsetting the balance and giving Anastasi the overall win of the day. Vassallo and Sartori won a race each against each other. Ray Condachi remains the Series leader with less races sailed but no losses to date. Day Three of the 2015 RMYC Match Racing Series will be held on Saturday 21st February.